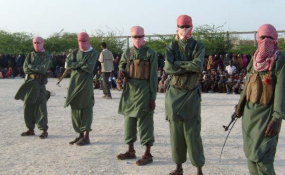 Members of the militant Al-shabab in southern Somalia. On Nov 4, 2017, US airstrikes hit Buqo area in Bari region of northeastern Somalia targeting leader of the Pro Islamic State militants Sheikh Abdulkadir Mumin. A statement from Africom said the strikes were in coordination with the Somalia government. An unknown number of militants were killed. "U.S. forces conducted two separate airstrikes against ISIS in northeastern Somalia on Nov. 3, killing several terrorists" the statement read. "The first strike occurred at approximately midnight local Somalia time with the second separate strike occurring at approximately 11 a.m. local Somalia time" it added. "We are currently assessing the results of the strike," said AFRICOM in a statement. Buqa is an ISIL stronghold in Bari region of Puntland state. "U.S. forces will continue to use all authorized and appropriate measures to protect Americans and to disable terrorist threats. This includes partnering with AMISOM and Somali National Security Forces (SNSF); targeting terrorists, their training camps and safe havens throughout Somalia, the region and around the world" it added.